Goat was a pivoted version of Onion, where the 'arms' pivoted forward over the tank and dropped on the obstacle from above, it could be used to straddle the target with a set of charges on each side. Fascine was a bundle of wooden poles, rough brushwood, or metal poles carried on the front of the AVRE. Metal pipes in the center of the fascine allowed water to flow through. They were used to fill ditches and trenches or form a step allowing the armour to roll over without getting trapped. AVRE with Bobbin - A reel of 10-foot (3.0 m) wide canvas cloth reinforced with steel poles carried in front of the tank and unrolled onto the ground to form a "path", so that following vehicles (and the deploying vehicle itself) would not sink into the soft ground of the beaches during the amphibious landing. 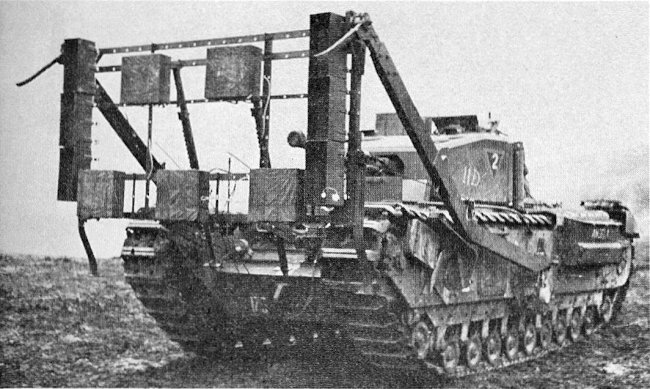 AVRE with Small Box Girder Bridge was an assault bridge that was carried in front of the tank and could be dropped to span a 30-foot (9.1 m) gap in 30 seconds. AVRE with Bullshorn Plough. A mine plough intended to excavate the ground in front of the tank, to expose and make harmless any land mines.